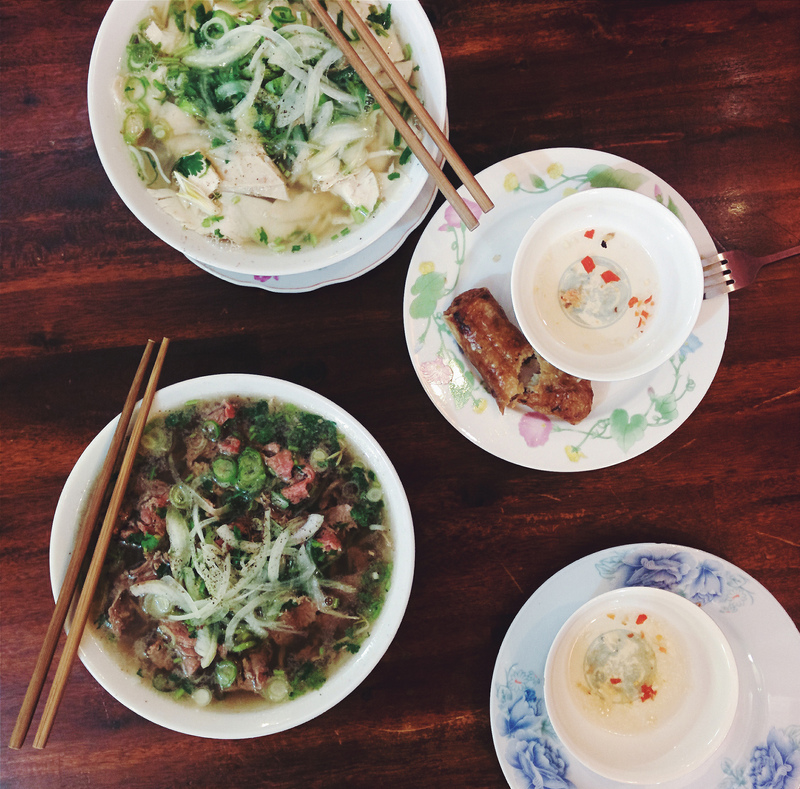 Home » Memories of a Glutton » Phở is Not Your Foe!!! Phở is not your foe!!! I am serious here folks. Though it makes me happy that everyone loves this yummy noodle soup from Vietnam, the actual name is being mangled!! Pronounce it like “Ph-uh?” Practice this ten times and see your server smile the next time you order correctly. I am not afraid to admit that I am a Phở snob; I will not eat it in any restaurant that does not dedicate itself to Phở and Phở only. Phở , which can be made with beef or chicken, is a meal unto itself and thus it should be treated accordingly. To eat Phở is a practice in meditation. It may come out in just a few minutes but is an artwork unto itself, depending on what type of Phở toppings you order. You should be able to smell the Phở broth before you even sit down. The aroma should permeate every nook and cranny of the house or establishment. The broth should always be a clear gray-brown topaz color. Nothing should be impeding your view of the noodles, meat topping and garnish of cilantro, scallions, and onions. The broth, in my mind, should stay clear to the very end of your dining experience in order to truly enjoy the essence of Phở. If you must add anything then just a squeeze of lime and a dash of pepper but nothing more. A perfect Phở broth will need nothing extra in order to enjoy the warm elixir. The Hoisin and Sriracha are meant to be used in a small sauce dish to dip your meat while eating. Adding them into the clear Phở broth just turns it into a muddy looking mess that does not allow you to taste the skill of the cook who caringly prepared the broth for hours. The plate of bean sprouts and Thai basil are there for you to use judiciously. They are flavor enhancers, not a side of veggies to go along with your Phở. Maybe 3 or 4 leaves of basil, torn and crushed, and a few pinches of bean sprouts can be thrown into your bowl. If you like your Phở spicy throw in a few slices of jalapenos, but I implore you please do not squeeze Sriracha into your bowl. The garlic and vinegar in the hot sauce will totally change the taste of the broth and you will no longer be experiencing the true flavors of the Phở in all its meaty aromatic glory. True connoisseurs will ask for certain accompaniments to go along with their steaming bowl of Phở. Some request for a bowl of thinly sliced onions that can either go into the bowl of soup or by itself. I find the onions accompany the different cuts of beef in the Phở extremely well. If you are a diehard connoisseur then you must have a bowl of the skimmed off fat from the broth with scallion heads in it. Pour some of the golden liquid directly into the bowl of Phở to add richness and body. However, too much and your arteries will be clogged!! Even when adding these accompaniments, look down at your bowl and notice that the broth will still remain clear, not cloudy. Conversation is not really encouraged during the eating of Phở because it should be eaten while steaming hot. Once finished, then you can relax and linger in conversation over a nice Viet coffee, iced or hot, or some tea. 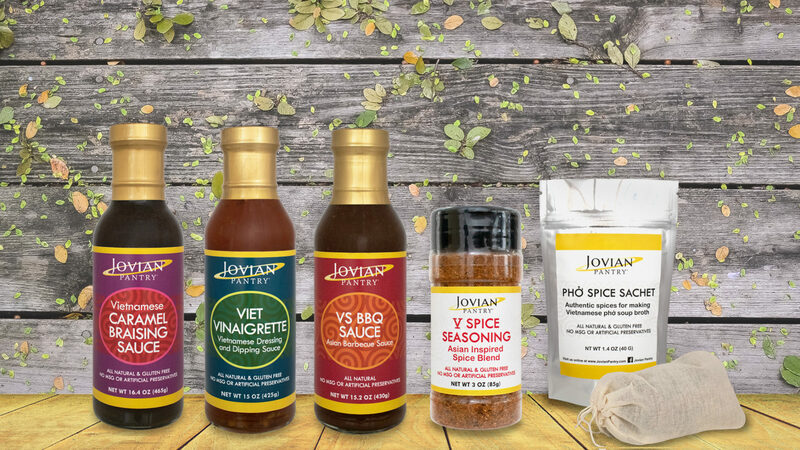 Jovian Pantry® has made it even easier for you to make an easy, authentic, delicious version at home in under 2 hours with our Phở Spice Sachet. Find your own happiness over your own bowl of Phở. Remember, Phở is not your foe!! !